The new 13-second spot is short and sweet, similar to previous commercials featuring Apple's portable products. Like those past ads, "More Powerful, More Colorful" puts the device front and center by setting it, and a series of band accessories, off against a stark white background. 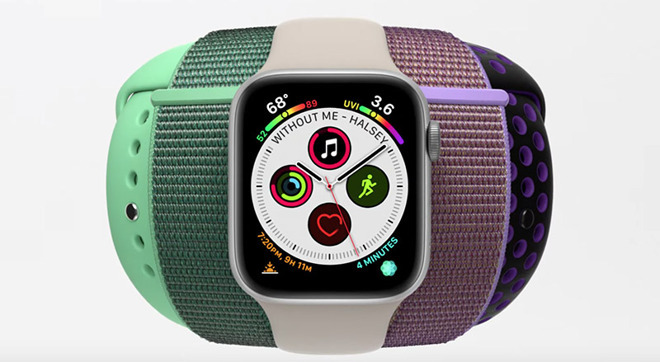 A silver Apple Watch Series 4 is used throughout the spot as bands of various colors, styles and materials are swapped in and out of the wearable's patented magnetic receptacle. Starting with what appears to be the recently released Papaya Sport Band, the commercial cycles through current colorways in that style before showing off Nike Sport Band and Sport Loop options. With Apple Watch facing toward the viewer, and donning a stone Sport Band, combinations of bands and loops fan out from behind the device's silhouette. Nearly every color Sport Band, Nike Sport Band and Sport Loop are represented in the ad, though more expensive leather and metal offerings, including the Modern Buckle, Leather Loop and Link Bracelet are not shown. Interestingly, the popular metal mesh Milanese Loop does make a brief appearance. "Apple Watch Series 4 is completely redesigned. And now you can give it a fresh look with new bands in a variety of styles and colors," Apple says in the video's description. Apple Watch Series 4 debuted last September as the first major revamp of Apple's health-centric wearable. With a larger OLED display, slimmer profile and a novel ECG feature, the device has seen brisk sales since launch. Most recently, Apple expanded availability of the Series 4 ECG function to Hong Kong and select areas in Europe.